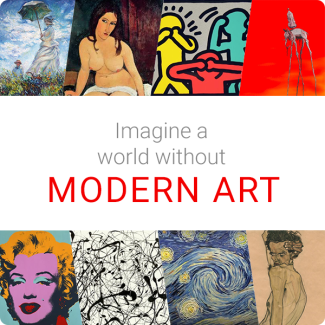 That's why The Art Story Foundation’s vision is a world where the ideas and aspirations behind the wonderous modern works are accessible to anyone to explore and be inspired by. We invite you to partner with us in fulfilling that vision. The appreciation of these inspiring works by current and future generations is in your hands. Without your generous support, people all over the world will have no choice but to continue to struggle to understand Modern Art. For only $36, YOU can make sure this never happens. Together we can ensure that everyone’s life can be infused with the beauty of art.